This year's annual "Gathering of Eagles" in Homer, Alaska included about 300 of our finest winged friends. In this image I was prefocused on the birds in the background when the eagle flew right into the middle of the picture, talk about timing! See my photostream for more meetup photos. 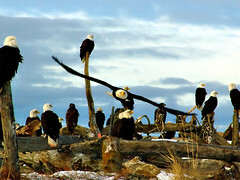 Also see the group "Gathering of Eagles" for pictures from all the people who were there!